René Le Fort (1869-1951) was a French army surgeon who conducted a series of thorough, if somewhat macabre, experiments on the heads of cadavers. The results of his work gave rise to a system of classifying facial fractures, now known as Le Fort types I, II and III. 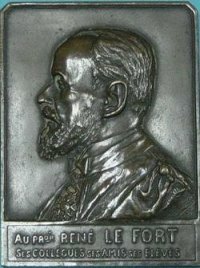 Le Fort had a distinguished career in surgery and teaching and served in both world wars.